At Bal Bharati, education aims at the training of the body, mind and conduct of a student. We strongly believe in the maxim , “ A healthy mind resides within a healthy body”. To achieve this, students need regular and organized forms of physical exercise and mental work. It is for this purpose, physical education forms an integral part of our education system. Its importance for us encompasses more than just the benefit of physical activity. It also develops self-esteem and mental alertness. Not only does it empower youth, it also motivates students to maintain a healthy lifestyle forever in their lives. Our team of skilled physical trainers and coaches offer expert training and guidance to our young learners and prepare them not just for activities and competitions but for a healthy life. Athletics, Basket Ball, Volley Ball, Cricket, Table Tennis, Badminton, Judo, Karate, Hand Ball, Throw Ball, Tennis, Swimming, Chess, Foot Ball, Rhythmic Skipping ,Physical Fitness & Skating. Abhishek Sharma (XII A) was awarded Gold medal in U-19 School National Game (SGFI).He represented the Delhi team which was declared as the winner of the tournament. He is also participating in Khelo India Khelo Boys team U-21 being held at Pune. 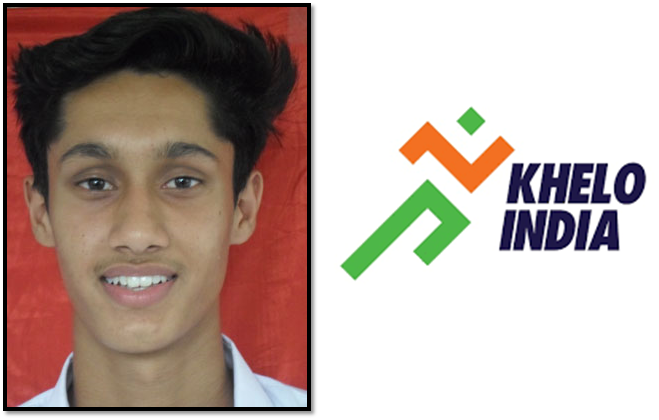 Abhishek Sharma was also selected from Delhi State to attend the National Coaching Camp of the Indian Senior Men’s Basketball Team at Basketball Academy, Jayprakash Narayan National Youth Center, Vidyanagar, Bangalore from 21 November to 08 December 2018 to prepare for the Super Kung Sheung Cup International Basketball Invitation Championship which was held in Hong Kong in December 2018. 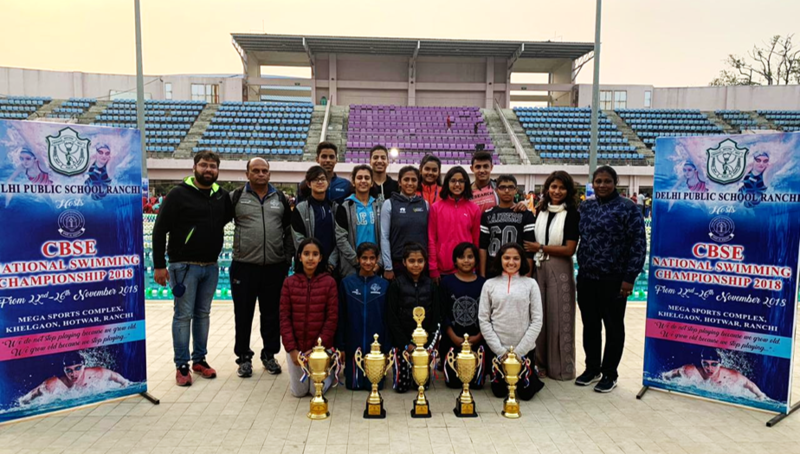 The school won the Overall Championship for the fourth consecutive year in the CBSE National Swimming Championship 2018 held at DPS Ranchi. Altogether, the school won 43 Gold, 4 Silver, 5 Bronze medals in different events . 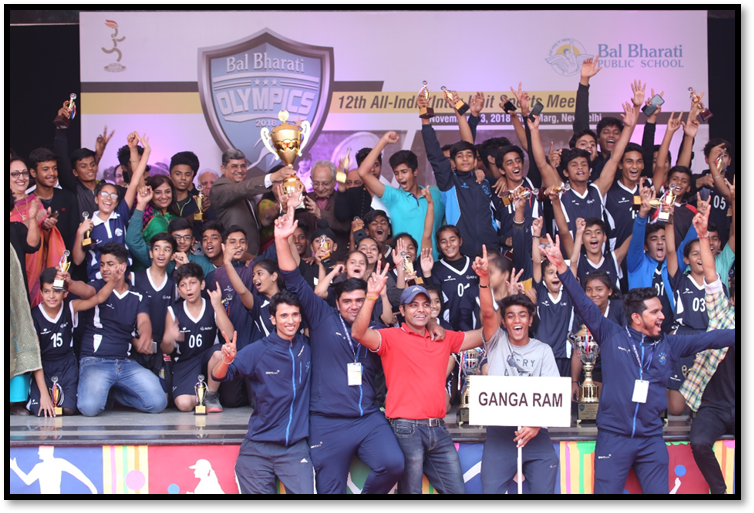 The school was declared as the Overall Champion of the 12th All India Inter Unit Bal Bharati Sports Meet 2018. We won the championship for third consecutive year. The School won the Overall Championship. “Every child must participate in one game or other,” exhorted Principal L V Sehgal while addressing a captivated audience during a special joint assembly. 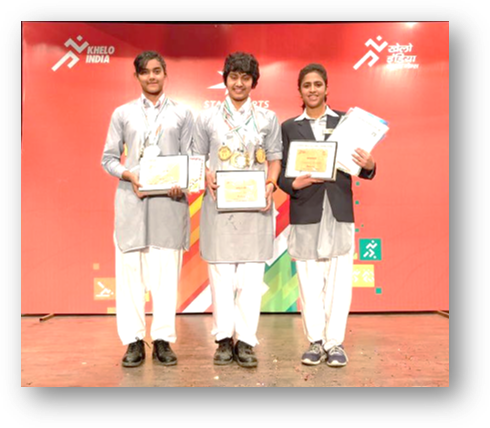 The purpose of this event was to honour Sports Achievers of the session 2017-2018, of all the 16 disciplines of sport that the school nurtures. In a resplendent display of pride and talent budding sporting talent of the school, stepped into the spot-light amidst the echoing beat of drums. 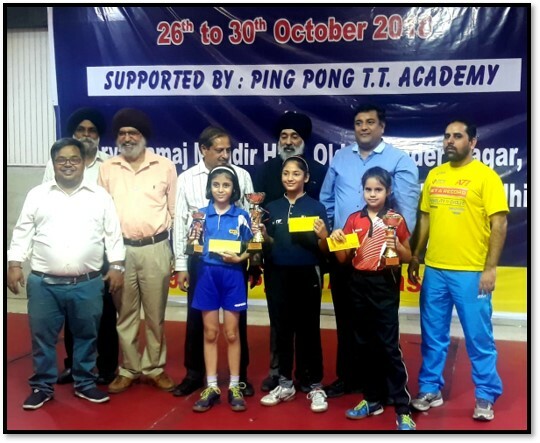 Each achiever was honoured with a medal and certificate by the Principal Mr Sehgal, Sports Director Mr Anand Seth, officiating VP Ms Meena Malhotra, Chief Coordinator Ms Poonam Sondhi and Head Mistresses Ms Sunita Gehani and Ms Neelam Ahuja. 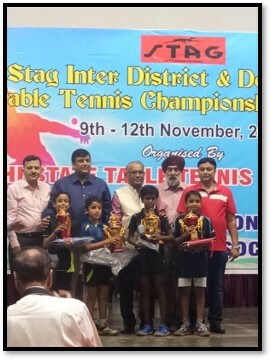 Achievers in team events proudly lifted their trophies. The highpoint of the event was the honour bestowed on the participants of the 11th All India Inter Unit Sports Meet held at Bal Bharati Public School, Ludhiana in which our unit won the Overall Championship. The Principal lauded the efforts of the Sports Director Mr Anand Seth and his team of Physical Education teachers and specialised coaches. The event marked the glory that comes with being sports stars who add laurels to the institution. Varun Patel (XII F), Jasmine Gurung (XII F), Anubhuti Baruah (XI) and Annie Jain (X A) participated in Thailand Age Group Swimming Championship 2017 which was organised by Thailand Swimming Association from 1 to 5 April 2017 in Pathum Thani, Thailand. Annie Jain won a silver medal in 50m breast stroke. The Boys Volleyball team (U-14 category) won the Winner’s trophy in 2nd VERVE Championship 2017 organised by The Heritage School, Sec- 23 Rohini from 24 to 27 April 2017. Vansh Singh (VIII H) was declared the Best player of the tournament. 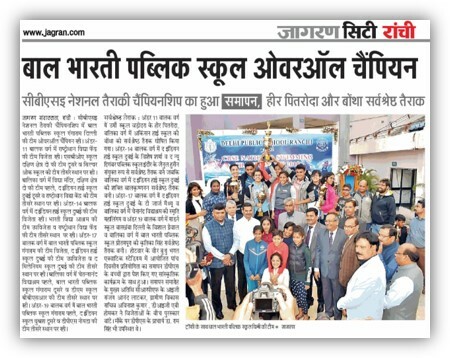 64th National School Games Tournament held at Mata Kankeshwari, Vidya Vihar School, Indore, M.P. 1) Aarohi Gupta - PS B, Age group- under 4, Adjustable skates, 200m race- silver. 2) Ranak jain - I E, Age group- under 6, Quad skates, 200m race- Bronze and 300m race - Silver. 3) Ananya Mehta - II F, Age group- under 8, Quad skates, 300m- Silver. 4) Saanvi Taneja - II D, Age group- under 8, Inline skates, 300m race - Bronze. 5) Aryan Gupta - III G, Age group- under 8, Inline skates, 300m race- Silver. 6) Naman Pahuja - V G, Age group- under 10, Quad skates, 300 m race - Bronze. 3. Krisha Kher. Class:- 7-A. 1. Sakshi Mehta. Class:-7-A Bronze Medal.(3rd). 2. Shivanshi Kalra. Class:-7-A Under-14.(Girls). Bronze Medal.(3rd). 3.Krisha Kher. Class:-7-A Bronze Medal.(3rd). 1. Shreyas Sharma. Class:- 6-H Bronze Medal..(3rd). 2. Ishaan Lal. Class:- 9-A Under-19.(Boys). Bronze Medal.(3rd). 3. Lavi. Class:- 10-D Bronze Medal.(3rd). 4. Shivendra Sharma:- 10-E. Bronze Medal.(3rd). In the CBSE Swimming Zone organised by Mother Divine Public School, held at Govt. Sarvodya Co-ed held on 20 & 22 October 2018, our students won 56 Gold, 14 Silver and 3 Bronze Medals in different categories. In the 64 National School Games held at SPM Swimming Pool Complex, Talkatora Stadium ND from 13-19 December 2018. Our students won 13 Gold, 6 Silver and 3 Bronze medals in different categories. 2nd Inter School Karate and Taekwondo Championship 2018 held at Azalea Banquet Hall, Naraina, Delhi. Inter zonal skating tournament organized by Govt of NCT of Delhi, Directorate of Education, Sports branch at Rajiv Gandhi Stadium, Bawana. He has been selected for the SGFI Nationals to be held in Belgaum(Karnataka) from 9 to 13 Dec. 2017. The programme, Yog Yatra, an initiative of Child Education Society, in collaboration with Mokshayatan Yog Sansthan, was launched in an impressive ceremony hosted in BBPS, GR on 19 May 2018. The occasion was graced by the presence of the renowned yoga guru, Padmashri awardee, Swami Bharat Bhushanji, the founder of Mokshayatan International Yogashram. In accordance with the memorandum signed between Swami Bharat Bhushan ji and Shri L. R. Channa in the presence of the witnesses Mr LV Sehgal, Principal, BBPS, GRH Marg and Ms Apurvaa Saxena, Head, Delhi Yoga experts from Mokshayatan would conduct sessions twice a week from July 2017 to February 2018, in the premises of all Bal Bharati Schools in Delhi and NCR of Brij Vihar, Dwarka, Ganga Ram Hospital Marg, Manesar, Noida, Pitampura and Rohini for students, parents, faculty members and the neighborhood community free of cost. To promote a healthy and harmonious way of life and to in-build yoga as an inseparable part of life, ‘Yog Yatra’ was inaugurated on 7 July 2018 in the school campus. 150 participants have registered till date from the neighbourhood community and classes are held twice a week from 07:00 to 08:00 am on Saturdays & Sundays. On the basis of superlative performance in the Junior National Basket Ball Championship, Abhishek Sharma (XII) was selected to attend the National Coaching Camp of the Indian U18 Men’s Basketball team to prepare for the SABA (South Asia Basketball Association) Zone Qualifying Round for the FIBA U18 Asian Championship 2018. Subsequently, Abhishek‘s excellent performance led him to be selected for SABA Championship 2018 held in Bangladesh from 9 July 2018 where the Indian team defeated Maldives and bagged the SABA tittle. On the occasion of International Women’s Day, our school hosted a Star Sports initiative organised by Big Show Entertainment associated with the Khelo India Campaign, launched by the central government. National Level Swimming stars Annie Jain X A, Vanshika Sharma IX E and Shivangi Sarma X C, who had bagged gold, silver and bronze medals at Khelo India School Games and other prestigious championships were honoured by Mr. Rubbal Dutta, Vice President Star Sports and Mr. Manmeet Ratan, Director from Big Show Entertainment. AIFF ( All India Football Federation) in collaboration with Shiksha Foundation organized an under-12 Girls' Grassroot Football League at the Pusa Road Campus on 6.12.2017 & 7.12.2017. Six schools included our school participated in the event. The other participating schools were - Modern School, Barakhamba Road; St. Michaels; Bal Bharati Public School, Pitampura and Blue Bells Model School. The tournament was flagged off by the Headmistress Dr. Sunita Gehani on 6.12.17 with a Hand Shaking Ceremony. All teams participated with enthusiasm and vigour. Our school team which comprised girls of class III were the youngest participants and their performance was applauded by all. The Winners Trophy was lifted by Blue Bells Model School. The Award Ceremony was held on the final day of the tournament- 7.12.17 and was graced by Mrs. Shweta Sharma, manager, AIFF along with Headmistress, Dr. Gehani. The federation presented T-shirts to all the participants and teacher escorts along with two footballs to each team. The tournament which aimed at encouraging girls to learn and play football was a great success and was an enriching experience for the promising players of tomorrow. Mr Ravinder Singh Dahiya (PET) participated in 19th Asia Masters Athletic Championship held at National Stadium, Singapore from 4 to 8 May 2016. Mr. Dahiya got the Gold Medal in High Jump with an outstanding performance of 1.80 m in the age group of 40-44.